Good news for HBD deniers? Using an existing pool of known intellectual disability genes, we constructed a set of 168 candidate genes for normal-range intelligence, and tested their association with intelligence in 191 individuals (aged 5–18) sampled from the high and low ends of the IQ distribution. In particular, we 1) employed exon sequencing to examine the possible effects of rare genetic variants in the 168 genes, and 2) used polygenic prediction to examine the overall effect of common genetic variants in the candidate gene set in a larger sample (N = 2125, mean age 20.4, SD = 14.1). No significant association between the candidate gene set and intelligence was detected. Of course I’m not surprised this study found nothing, because genes that cause organic retardation (which are presumably what they looked at) should have little to do with normal biological variation in intelligence, because organic retardation, by definition, should have an exceptional cause. Instead they should have been looking at the genetic causes of familial retardation, because familial retardates are just the extreme low end of the bell curve of the biologically normal population that has a mean of 100, while organic retardates are a different population with their own bell curve, with a mean of about 50. Just as some biologically normal people have IQs below 50, some organics have IQs above 100, but the two groups are qualitatively different, even when they are quantitatively the same (i.e. matched on IQ). Of course we don’t know the genetic causes of familial retardation which is precisely the problem. Scientists have only discovered the causes of organic retardation, not biologically normal variation in intelligence. An ideal study, would be to compare the DNA of biologically normal people from around the world who are say 50 IQ points smarter than others of their country and ethnic group, with those who score 50 IQ points lower than others of their country and ethnic group. But it would be essential that those scoring 50 points lower are familial retardates, not organic retardates. As for those scoring 50 points higher, it’s generally assumed that giftedness is always familial, but if organic giftedness exists, they should be excluded from the study too. To understand the difference between organic retardates and familial retardates, consider the difference between organic giants and familial giants. Familial giants are biologically normal people who are over seven feet tall. Because they are biologically normal, they have all the traits associated with height. They tend to be men. They tend to be black or caucasoid. They tend to be good at basketball. They tend to have tall siblings. They tend to have lots of girlfriends and radiate good health. By contrast organic giants tend have something wrong with them like a pituitary disorder. They are the same height, but they tend to look odd, they are bad at sports, they don’t get many dates, they don’t have tall siblings. Even people from demographic groups we don’t consider especially tall (i.e. Chinese women) can be organic giants. Analogously, organic low IQ people tend to have something wrong with them like an extra chromosome, and they tend to look very different, and do not have the background normally associated with low IQ; they are virtually no more likely to come from low IQ families or low IQ demographics than anyone else. As a result, genes or genetic variants that causes organic retardation can be very different from genes or genetic variants that cause normal intelligence variation. A good example might be myopia. It is believed that high IQ and myopia both have a common genetic cause. But as scholar Arthur Jensen has noted, people with Down’s Syndrome show the same rates of myopia as everyone else despite averaging IQs around 50. This is because Down’s Syndrome is organic and thus overrides many of the normal genetic causes of IQ. But this is precisely why focusing on organic retardates can be so misleading when searching for the causes of biologically normal IQ variation. It used to be thought that high IQ people had myopia because they did a lot of reading and other “near work”, but the fact that Down’s Syndrome people have the same rate of myopia as the general population helped debunk such environmental explanations. ated. Your example about supposed biological normal smarts is very simplistic. Height correlate weak with “intelligence”. Correlations can AND generally are more complex what you ( seems )are imagining. No there biologically normal or anormal. Down syndrome is not anormal condition, even defects are logically explained. Complex system are more suscetible to have errors. Normality in reality mean majority, normal are biased with morality, right to say is common or ordinary people. To be normal, is to be natural, be yourself. To be unusual or uncommon no need necessarily imply pathology. Seems simple to understand. Popular higher iq, called high functioning sociopath tend to be useless, our “loved and lovely” elitz. Real smart, problem solvers, creators and inventors, tend to have mental or physiological defects. Even “popular higher iq”s can have defects cause by physiological custs of giftedness and others human exceptionality like unusual personalities ( extravagant). Second, intelligence (s) are PHENOTYPES, COMBINATIONS OF TRAITS and not separated traits. Then, you need analyse “heritability” of intelligence phenotypes and by genealogical studies. Like “personality types” heritability, aren’t a single trait. Epistasis. Some traits depend the type of combination to be effective, neutral or without correlation. PP’s comparison of organic vs familial giants doesn’t make any sense. To say taller people get more dates than shorter people is to say smarter people make more money than dumber people, without going into other variables such as perceived attractiveness/phenotype and occupational salary when it comes to money. I’ve seen short black men get dates with other women, and not many tall or short Asian men can do the same, and so height has nothing to do with it. It still doesn’t explain why short black men do better in dating than tall Asian men in western countries! And PP, you failed to take note of facial/racial phenotype. It’s anything from the neck and above. OT on the ‘short black men…’ and? Asian men tend to be shorter than average, have features deemed ‘unattractive’ by Western culture, and also themselves come from a more introverted culture, which explains their lack of success. The more an Asian man conforms himself to a particular cultural ideal of attractiveness, the more success he will have. But, as I have said elsewhere, nerds value ‘integrity’ past the point of all practicality. Most Asian men are perceived racially unattractive to the average Western women (regardless of race). Tall or short, it does not matter. They cannot blend well in Western Civilization because of this reason. It will make them suffer if they tried hard. I made the comparison between short black men and tall Asian men to make my case, and how societal values and beauty standards have already been set in place. Most Asian men are perceived racially unattractive to the average Western women (regardless of race). I don’t disagree with you. But ‘being Asian’ also correlates with a lot of other ‘unattractive to the average Western woman’ traits. If an Asian guy talks, walks, acts, and dresses like a cool white guy, he will have success. Now, he won’t have an equal amount of success as a ‘cool’ white guy, because he is Asian, but he will be successful. It will make them suffer if they tried hard. I disagree with you here. Talking to more people isn’t that difficult. It’s not even remotely true for most Asian men, even if they act “White” to become accepted in Western society, especially with its women. If you have not read the news already, this Asian guy in the UK has committed suicide, because he could not find a White woman (I would assume this was his reason). I say he is “White” as you can find for an Asian man. He has a White surname and I assume he acted and talked just like any British White. Some traits can correlated with a certain kind of ”intelligence”. For example, blue eyes. In the past, woman with blue eyes were probably very valued in the mate market. Dominant man CHOICE the most beautiful and rare woman to procreate. Result= blue eyes correlate with intelligence. Health correlate with certain level of intelligence but the extremes levels of intelligence (creativity and wisdom) correlate UNLINEARLY with health (better body, height). less attractive than ”supposed normal biological smarter people”, as Pump said. I didn’t say ‘white.’ I said ‘cool white guy.’ There is a difference. This Asian fellow probably acted like most nerdy white guys and had even less success than a nerdy white guy (probably because the nerdy white guy could still at least use his ‘white’ status to get an asian woman at least). Stop the presses. It’d be one thing if he was fit, had a good sense of style, etc., and still decided to kill himself. That is not the case: look at him in the picture. He’s fat and has terrible fashion sense. No cool white guy looks anything like he looks, and he wonders why the world treats him nothing like it would treat a cool white guy. Well, they have plenty of Asian women to get with. I think whites and Asians are compatible in a society precisely because we are sufficiently different. No need to step on one another’s toes, so don’t gloat on their small relative disadvantage with white females. but height only up to a certain point. what women want is a man who’s taller by 4″ or more, not a giant. and then men they’re most strongly attracted to are usually not the tallest. over 6’3″ is unattractive to most women in my experience. there is a theory that rarity/standing out makes one more attractive all else being equal. so a brown eyed woman will be more attractive if she’s surrounded by blue eyed women. this might also apply to tall men, but it doesn’t apply to tall women or short women or short men. and Scandinavia and the Baltics have near 100% blue eyes. northern dogs also have blue eyes. so non-brown eyes aren’t the result of sexual selection. I have heard that novel features make an individual more attractive. I don’t believe it. The more an individual looks like any preconceived or manufactured archetype, the more their life will resemble that archetype’s. It’s very cultural. We can see that Asian men have the same reply rate from white females that black men do. 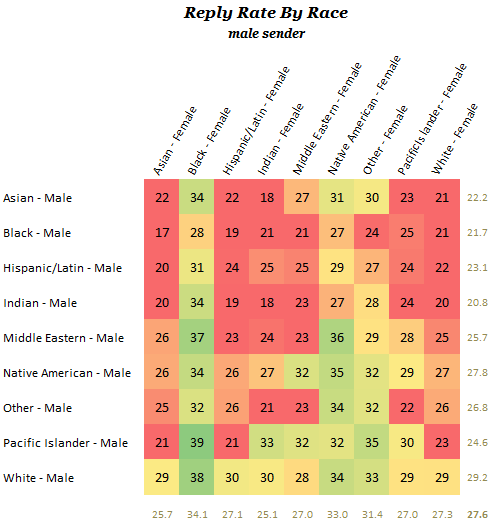 Asian men, overall, actually seem to do better than black men. Overall, men simply do not do that well. White men are looking at 3/10 response rate versus 1/2 for white women. Most Asians don’t fit the Western standard of beauty. And given the very strong propensity for White women wanting to date White men, and not much any other men, Asian men would be clearly at a disadvantage over Hispanic and black american men, because the latter 2 groups have visible Caucasian ancestry, which is reflected in their facial features. In regards to black guys, White women tend to date black men who conform to those features, not always, but most black men who are with White women tend to look “less black”, meaning lighter skin and less African features. Yes, Swanky, and I personally know a few men who were brought up Muslim of Middle Eastern ancestry (they all look White), and are not so much religious now. They all dated White women, and the most Westernized East Asian man seem to have much difficulty dating women outside of their community. It’s not a particularly clear area. IIRC the gallup poll showed white women as being less likely to date Asian men, with ~10% saying they had dated an Asian man, versus 24% having dated a black man. If by ‘westernized’ you mean fat and no sense of style and nerdy, I agree with you. But a (forgive my stereotyping) ‘Fast and Furious’-looking asian? Completely disagree. “Asian” isn’t a homogeneous category. there are some “Asians” who have the bodies of American football players, namely Manchus, Mongols, Tibetans. one commenter here claimed that the so-called Han are more diverse at genetic level than Europeans. all of these still have the Mongol facial skeleton, of course. sub-continent-als, Indians, tend to be gracile even when they’re tall. the strongest guy (i’ve seen) at my gym is a short fat “Asian”. maybe he’s part Hawaiian, but i don’t see it. of course my gym is crappy. so his Herculean lift was squatting 455 lbs twice. 1. there is a widespread confusion between abnormal and pathological. and more, this confusion can force abnormal people into pathology. being “different” may be associated with being neurotic or depressed as a result of social forces, not as a direct result of being “different”. 2. psychological traits are not things or “natural kinds” but result from things. what these things are is obscure. there is a widespread confusion of word and thing, of human abstraction or description and things as they are in themselves. nope, the first part, yes and no. Psychiatry want the impossible “perfection behavioral” of human beings ( behavioral equality to oligarchy collectivism dictatorship) as well leftoids want impossible. Cognitive equality. Personality is a bio-interactive product of brain thing-traits, like autism is a exterior manifestation of brain morphology ( and other traits) . Personality is a metaphysical things honey. santa claus has a vag? Ahh, so they didn’t find it. And I don’t know what genes cause the rooster to crawl in the morning, so I guess it doesn’t. If you still tell me roosters can and does crawl, that must be because you can’t comprehend that the genes haven’t been identified. if one allele is known to cause disability, then it is reasonable to hypothesize that other alleles of the same gene should have an effect on IQ. they don’t. not even in combination. was cnv included as a variant? there are only about 20,000 genes. If one allele makes one an 8 foot tall giant, should we expect other alleles from the same gene to have an effect on normal variation in height? I suppose. But the problem is organic retardation is typically caused by single genetic mutations with large effects, while normal IQ variation is thought to be caused by a great many very tiny genetic effects. So (as you alluded to in another post) you need incredible sample sizes to detect any one genetic variant with any kind of certainty. Better, blue eyes correlate with income. Dominant man create a better environment to live. Dominant and smart man (smart to adapt) choice more blue eyes girls. prof shoe claims 100,000 – million will be required. but he also claims he’ll be able to use CRISPR to engineer Telosians. i’m no RC in that regard. i do hope he’s right. but i doubt it. for one thing there may be a not very high ceiling for cognitive ability which has already been realized. there’re millions to be made from breeding a super horse, and horses can reproduce at age 2. yet in 1973 Secretariat set records in all three triple crown races which still stand. that’s perhaps 20+ generations of race horses. Secretariat was 3 when he set his records. he won the Belmont by 31 lengths. He set race records in all three events in the series – the Kentucky Derby (1:59 2/5), the Preakness Stakes (1:53), and the Belmont Stakes (2:24) – records that still stand today. There are many different determinants of IQ or g: brain size, nerve conduction velocity, brain glucose metabolizaion efficiency, degree of nerve myelination etc. There might be a relatively low ceiling on each of these determinants, but genetically engineering an individual with all of them at that ceiling could be the smartest human who ever lived. 1. it can merely be the smallest value for a large number of alleles, thousands. IS NOTORIOUS EVIDENT, BLANTANT OBVIOUS, that SOME novel traits will be more valued because beautiful rarity. I imagine “super higher iqs-things” people would be faster to understand it, obvious. Blue eyes, specially, very blues eyes are beautiful than Brown eyes like a caribbean sea is beautiful than arctic sea, grrrrrrrrrrrrrr. taller woman, generally, will be less attractive specially because Height and higher testosterone, masculine features, G-E-N-E-R-A-L-L-Y. Human eyes are naturally curious. Our eyes want something new to see. There is not much novelty with interracial dating among Western women. They usually want to date men who look familiar to them or fit the beauty standard. Like Keanu Reeves, who have some Asian ancestry, but doesn’t look Asian that much. Even with black men, White women date those who are lighter skin with Caucasian ancestry, visible on their face. Very higher intelligence is very organicaly complex and gene-rally, have physiological costs because is a unbalance of organism, like Everest mountain is unbalance of Himalayas. And, and… Because is a RARE “event”. All recessive and or minority complex phenotype is epigenetic. First, infection. Second, period of harmonization, metamorphic genes. We domesticating our genes too, i.e, changing ( is not a chinese city sorry) our mutational ( pathogenic) load to “genes”. We are a multiple replications of microorganisms. Then, our genes are “like” very older pathogens. expected the ” funny joke”.